I have written about our local problems with water. From plenty to potental shortage. I is not only the effects of last year's earthquake but of shortage through abrupt climate change, something that, up to now has gone completely unacknowledged, except by a few people with plenty of commonsense. Wellington's fragile freshwater supply is set to become less of a worry, with hydrogeologists looking for emergency supplies under the city. November's 7.8 magnitude Kaikōura earthquake exposed Wellington and Porirua's reliance on feeder pipes to deliver fresh water from other centres, with the pipes crossing over fault lines in multiple places. That fragility means central and eastern parts of the capital could wait up to 100 days for water supplies to be reconnected after a big quake. 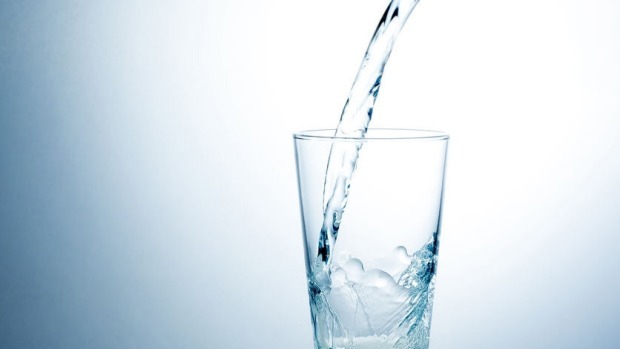 To ease the pressure, Wellington Water is investigating 11 possible sites for emergency water bores in Porirua and Wellington, and 11 stream catchments. Later this week, it will also start drilling into the Waiwhetu Aquifer under the harbour, off the northern tip of the Miramar peninsula. Wellington Water chief executive Colin Crampton said the projects would improve the city's resilience. "After a major earthquake, the water supply will stop. Even though it's a great source, our early settlers built a lot of that infrastructure over known fault lines," he said. "One of our critical jobs... is to address the 100 days in the eastern side of Wellington. "This morning we sent a drill rig out into the harbour, and the idea there is if the aquifer does indeed go all the way out through the harbour and to the entrance, we should be able to drill down and find water. It should be of the right quality and quantity to provide an alternative source." The 11 bores around the city would be completed within the next 18 months. In an emergency, utes would fill 1000L water bladders from the bores, and carry that water to 300 sites across the region. That would ensure no one had to walk further than 1km, or 500m in hilly areas, to collect 20L of water a day. The project is expected to cost about $12 million, $6m of which is coming from the government. Local Government Minister Anne Tolley said the recent earthquakes showed the heightened risk, and said the 100-day figure was pretty scary. "This part of [Wellington Water's] project was quite urgent, and we felt that, as central government, it was something we could actually partner with them. We're always worried about setting a precedent, we don't want to be working with all local government around New Zealand, but these two cities - Porirua and Wellington - had no local water supply. "It made sense that we went in partnership with them to provide these community based supplies," Mrs Tolley said. Despite the planned bores, Civil Defence Minister Nathan Guy said everyone needed to make sure they had enough water stored at their houses for the first seven days. "This is important, but it's not the be-all and end-all. Ultimately it's down to personal responsibility," he said. 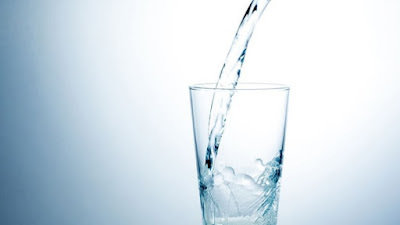 Wellington Chamber of Commerce chief executive John Milford said the effects of the capital losing water would bring the community to a halt and stop many businesses from operating. "We've got to ensure supply, and furthermore that we can get back to 'business as usual' as quickly as possible. "We commend both central and local government for working together to secure, strengthen and safeguard our region's resilience," he said. A winter drought in New Zealand is not so obvious as it is in Australia. However, I have noted that here where I live n Wellington we have never really recovered from previous droughts. This is confirmed by the fact that people in Ohariu Valley, near Wellington are having to get in water trucks in early-winter. I have also received a comment that the water table is worryingly low in Nelson. You’d be lucky to find any official conformation of this – but anecdote in this is invaluable. A year ago, Australia experienced its second-wettest June on record, but 12 months on, farmers in parts of inland New South Wales are worried they will not have enough. 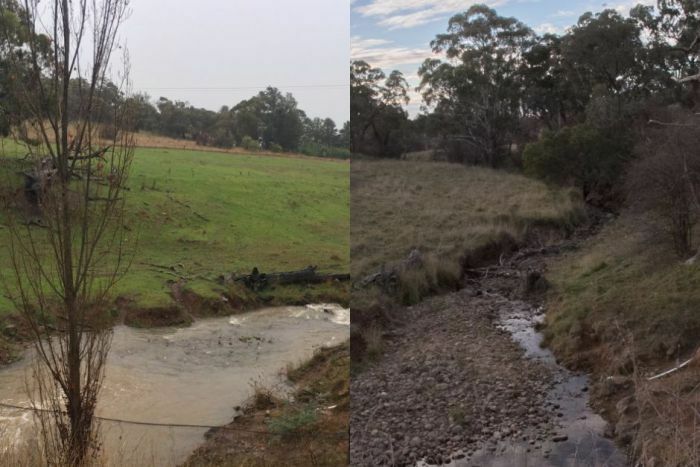 Mixed farmer Andrew Holmes, from Canowindra in the state's central-west, said this time last year the rain deluge had begun that eventually saw the Belubula River flood 15 times in three months. 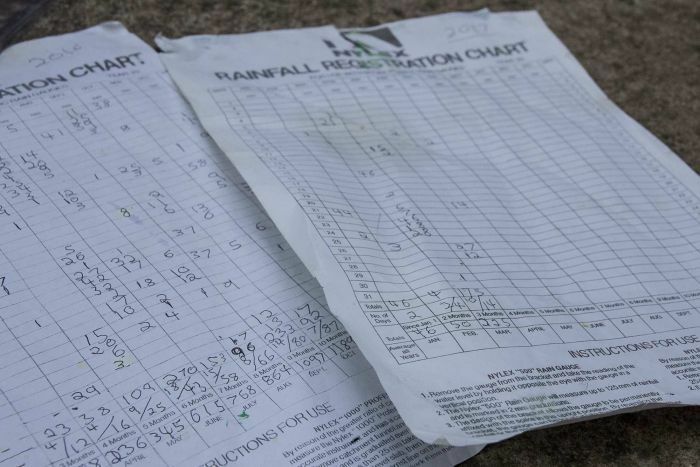 But compared to the more than 100 millimetres of rain he received last June, this year he has had less than 5mm, and is now looking upwards rather than downwards. "Last year we were looking down making sure we didn't get bogged or washed away," he said. "This year we're just looking at the sky and watching the weather forecasts, hoping for a bit of rain really in the next 10 days or so." Last year, June rainfall in NSW was very much above average, except for the far west and Hunter Valley. 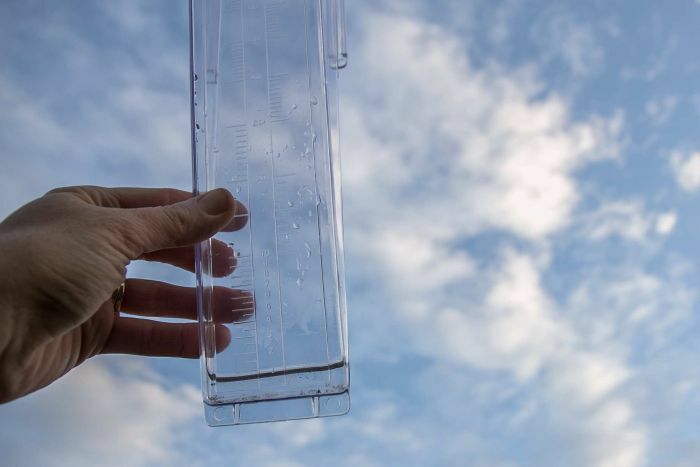 Official figures from the Bureau of Meteorology included 219mm for the Orange Agricultural Institute, which was its highest-ever June rainfall in more than 50 years of weather records for the site. However, the New South Wales Department of Primary Industries said falls across the state for this month were generally 60 to 80 per cent lower than normal. "A lot of it was very variable, very stormy, patchy rainfall, and unfortunately there are areas that missed out, primarily areas of the north-west and the central and northern central-west," seasonal conditions coordinator Ian McGowen said. He said more rainfall was urgently needed across most areas of the state to help primary producers with winter production. 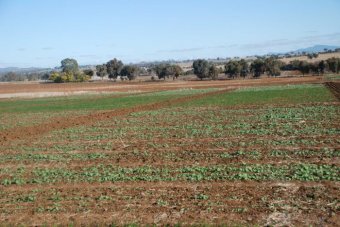 In the state's north-west, some farms have not sown crops because of insufficient soil moisture and others, particularly the later-sown ones, are struggling. Some livestock producers are grazing stock on crops or waiting to do so, and Parkes-based stock and station agent Geoff Rice said people were starting to get nervous. "Definitely a few nerves. If we don't see a fairly decent rainfall event in the near future things will definitely change," he said. DPI beef cattle officer based in Glen Innes, Todd Andrews, said the situation in the New England and north-west was a little less dire than in other parts of inland NSW, but producers were hoping for up to 50mm of rain soon to secure crops and pastures for spring. Tom Matthews, who farms near Grenfell in the central-west, said at this stage he was not concerned and was enjoying the dry days after difficulties shearing this time last year. "No dramas with wet sheep, it's fantastic. [We had] 163mm last year compared to five this year, so it's a big difference," Mr Matthews said. Another central-west business operator, Ian Rogan, who runs a commercial nursery at Millthorpe near Orange, has received about 27 millimetres in May-June this year compared to 261mm for the same period in 2016. "It was much, much wetter, I'd probably say even too wet in June last year, but this year it's just been extremely dry," he said. 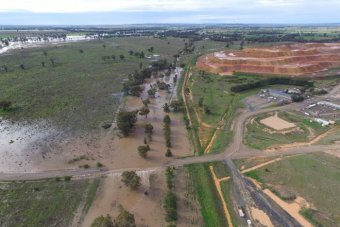 PHOTO: The Tomingley Gold Operations mine and the flooded Gundong Creek, July 20, 2016. This year Mr Rogan is having to water his 10,000 potted plants every few days, and he said he was looking for some rain to fall to encourage gardeners to get out into their gardens. For an inland NSW mine, the wet to dry turnaround between last winter and this one has its pros and cons. Alkane Resources director Ian Chalmers said he did not think he had seen it quite this dry for a long time at the Tomingley mine, and if there was not enough rainfall there could be concerns about water supply and dust control. However, he said he did not want the mine to get "washed away" like it did in the last half of last year, when May and June rains led to July flooding. "I guess we're like any primary industry, it's nice to have something in between," Mr Chalmers said. As farmers and others look to the skies, what are they likely to hold? The Bureau of Meteorology's rainfall outlook for June to August indicates drier than normal conditions are likely across NSW. Meteorologist and lecturer with Newcastle University, Martin Babakhan, said in the first few days of July there could be the chance of light rain in the state's inland, and then from the 5th until the end of the month, none at all. He said the Indian Ocean played the most important role in winter and spring, and it was in a "positive state" now, meaning there was going to be below average rainfall in those seasons for central and south-east Australia and NSW. "The winter is not a wet season for Australia. So still conditions are going to be dry at this stage," Mr Babakhan said. In another sign that the iceberg calving is imminent, the soon-to-be-iceberg part of Larsen C Ice Shelf has tripled in speed to more than ten meters per day between 24th and 27th June 2017. The iceberg remains attached to the ice shelf, but its outer end is moving at the highest speed ever recorded on this ice shelf. We still can’t tell when calving will occur - it could be hours, days or weeks - but this is a notable departure from previous observations. Comparison of speeds between Sentinel-1 image mosaics in early and late June 2017. The early mosaic combines displacements on the inner shelf measured between 6th and 12th June with similar ones on the outer shelf measured between 3rd and 15th June. The recent mosaic combines inner shelf displacements up to 24th June with outer shelf displacements only 3 days later highlighting a significant acceleration over those three days. The most recent observations on 27th June do not cover the rift tip, but a low resolution Sentinel-1 image of just after midnight on 28th June shows clearly that the iceberg remains attached to the ice shelf at its western end - for now. 3 years to fix climate change - 30 years ago we had 10. Nothing quite like optimsm and hopium even if there is no evidence to support it! In 1989 the UN warned that 1C could not be exceeded and we had 10 years to fix things. Now, 30 years later we are quite possibly at 1.8C higher than pre-industrial average termperatures (less than that if you believe the false figures) and we still have three years to get cliamte change under control. I wonder how they prepose to do that with a melting Arctic and dozens of self-reinforcing feedbacks. These experts say we have three years to get climate change under control. And they’re the optimists. A group of prominent scientists, policymakers, and corporate leaders released a statement Wednesday warning that if the world doesn’t set greenhouse gas emissions on a downward path by 2020, it could become impossible to contain climate change within safe limits. The group, led by Christiana Figueres, who oversaw the United Nations negotiations that produced the Paris climate agreement, base their case on simple math. The world, they calculate, probably has a maximum of 600 billion remaining tons of carbon dioxide that can be emitted if we want a good chance of holding the rise in planetary temperatures within the Paris limit of 1.5 to 2 degrees Celsius (2.7 to 3.6 degrees Fahrenheit). With 41 billion tons emitted every year from energy consumption and other sources, such as deforestation, there are only about 15 years before that budget is exhausted. Emissions can’t suddenly go to zero after 15 years — the world economy would grind to a halt if they did. Therefore, they must be put on a downward path almost immediately. “When it comes to climate, timing is everything,” write Figueres and her co-authors, including scientists Hans Joachim Schellnhuber and Stefan Rahmstorf of the Potsdam Institute for Climate Impact Research, in a commentary in the journal Nature. The commentary has six authors and was endorsed by dozens of co-signers from the climate science and policy world as well as from industry. The paper by Figueres, who now leads an initiative called Mission 2020, was directly aimed at influencing the upcoming G-20 meetings in Germany. It also notes President Trump’s decision to withdraw the United States from the Paris accord. “The whole purpose of this comment … is to wake up the intentionality and the ingenuity that we must bring to this effort, because of the urgency,” Figueres said during a call with reporters. Fortunately, global emissions have been flattening lately. Not going down — but not rising, either. The past three years have instead shown a leveling-off thanks to a decline of coal burning by the United States and China. Yet to achieve their objectives, extremely rapid carbon cuts would be required on a tremendous scale. By 2020, among other objectives, all of the world’s coal plants would have to be on the path to retirement (and no new ones can be built), and electric vehicles would have to explode in popularity, moving from 1 percent of global sales to 15 percent in just three years, an extraordinarily rapid rate of growth. Deforestation would have to decline sharply and then end entirely. By 2030, global forests would actually have to start pulling carbon dioxide out of the air. That is an enormous lift, given the entrenched nature of deforestation and the economic pressures in the developing world to convert forested land to agriculture and ranching. Coastal flooding and crop failures would create an exodus of ''eco- refugees,' ' threatening political chaos, said Noel Brown, director of the New York office of the U.N. Environment Program, or UNEP. Coastal regions will be inundated; one-sixth of Bangladesh could be flooded, displacing a fourth of its 90 million people. A fifth of Egypt's arable land in the Nile Delta would be flooded, cutting off its food supply, according to a joint UNEP and U.S. Environmental Protection Agency study. ''Ecological refugees will become a major concern, and what's worse is you may find that people can move to drier ground, but the soils and the natural resources may not support life. Africa doesn't have to worry about land, but would you want to live in the Sahara?'' he said. Excess carbon dioxide is pouring into the atmosphere because of humanity's use of fossil fuels and burning of rain forests, the study says. The atmosphere is retaining more heat than it radiates, much like a greenhouse. The most conservative scientific estimate that the Earth's temperature will rise 1 to 7 degrees in the next 30 years, said Brown. He said even the most conservative scientists ''already tell us there's nothing we can do now to stop a ... change'' of about 3 degrees. ''We have no clear idea about the ecological minimum of green space that the planet needs to function effectively. What we do know is that we are destroying the tropical rain forest at the rate of 50 acres a minute, about one football field per second,'' said Brown. Some very well-known people can get very angry if you try to burst their hopium bubble, especially if you back it up with evidence. Just yesterday Mr. Hockey Stick, Michael Mann, posted an attack on Guy McPherson with this article from our very own James Renwick. “The Labour group have already called for the resignation of the entire cabinet,” Blakeman, who also sits on the Tenant Management Organization, which runs the borough’s housing provisions, dded. “Such risks remain and we have had to take the decision to hold the meeting in private as to do otherwise would likely result in disorder,” they dded.